On May 15th, we were invited by Kamigamo shrine to “Chokusai”and a ceremony called “Shatoh no ghi” which was a part of “Kamo-matsuri”. “Chokusai” is a name of festivals to which an imperial envoy attends. “Kamo-matsuri (=Aoi Matsuri)” consists of three ceremonies; “Kyuchu no ghi”, “Rotoh no ghi” and “Shatoh no ghi”. 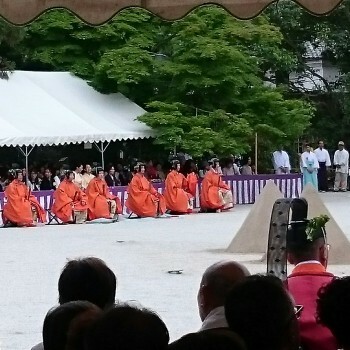 “Shatoh no ghi” is a ceremony taken place after the procession of about 500 people reaches Kamigamo shrine. 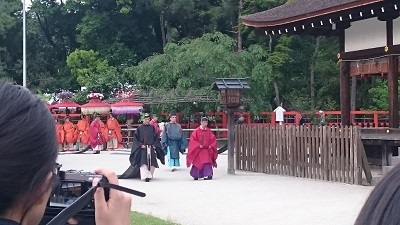 The procession starts from Imperial Palace, then proceeds to Shimogamo shrine and arrive at Kamigamo shrine. They are in disguise an imperial envoy, Kebi-ishi, Kura-zukai, Yamashiro-tsukai, Saioh-dai with items like Gissha and Furyu-gasa and they look like the real ones from Heian period. The envoy serves Shinto prayers “Norito” for the god and “Azuma-asobi no mai (dance)” is performed. And other ceremonies like “Souma no ghi” follow. It was the first time for me to watch these ceremonies closely. Although there was a time when the ceremonies were suspended due to social conditions during the long history of the festival, I was deeply impressed by the fact that the tradition has been inherited until now. I would like to thank Kamigamo shrine for giving me such a precious opportunity. Please have a look of photos of “Souma no ghi” posted on Instagram and facebook of LST.